Argh. My detox is a failure. I did it last week but it was also a failure. Today is also a failure. I need to do it again next week. Oh... if you have lots of wind in your stomach, try this drink: crush some ginger and mix with honey and water. Drink it warm. I'm going to drink this before I go to bed. I had a cruel dream this morning. I don't remember much of the dream setting except me and along other people were in some kind of working base, as we were all wearing some kind of uniform. There were a group of people bolted into the room and we all were laid down onto the ground on our left. Our hands were tied. There was this leader who looked like Ramualdo from Fantaghiro, the Italian movie, asked us a question. If we can't, his people would slit the throat. The girl before me was actually trying to seduce him but because she answered incorrectly, she was slit. Then it was my turn. Luckily I was asked a dumb question: What is the function of the Exit button? I answered correctly but weakly. So the leader came over to me and checked my pulse and freed me. I was carried to an infirmary where I woke up crying knowing that I was alive. And damn, the dream ended abruptly as I need to go to the loo. My head just kept on repeating 'cruel dream' as I went to the loo. Maybe I should take a break from reading a book called A High Priests War written by Michael Collins Piper. I remember the first time I asked for a refund when I just came back from the land of sheep was from Sans Francisco because their Chocolate drink was not chocolaty as the first time I had from the branch in Bukit Bintang. My colleagues then were very shocked by my reaction when I called up to enquire their refund policy. However, I don't remember when is the first time I complained to a restaurant about their service or food that I got something from the restaurant on the house. My family members were surprised. That's because their policy is 'No good service or food, I won't return for good but still I will swallow whatever is served in front of me.' Because of my 'open mouth' policy, it has given ways for my family members to adopt my style and they in fact much more aggressive than me in some events. I still have friends telling me to clam up should I not like the food or service. But I don't see why I can't since it's my money ruling the quality of the food and service of a place. It's my hard earned money, we are talking about. Don't you want quality too?? Today, I went to Carrefour for a refund too. I called up the services just to double check of a product price and realised I have been buying Sunmaid Raisins 340g for the equivalent price of 500g bag. If you were in my shoes, which product would you buy to stretch your money? If you could think of your money value, then it is very important for us as consumers to exercise our power. I only complain when it is necessary. I don't complain because I love to let people to hear my voice. So please don't think of a person who acknowledges and exercises her or his rights as some annoying customer just because you want to be unheard. I thought I have very serious dark eye rings and have been self-consciously applying eye cream to lighten up the eye area until.... I met my friend today in the supermarket. I could not really recognize but the first thing I spotted was her serious dark eye rings. She truly looks [not looked] like a real panda. The rings are black, not bruises colour like mine. And she looks like an owl that has forgotten to sleep during the day. And I forgotten to keep myself in check I blurted "Aiyo what happened to your eyes?!" HAHA. OOPS. Her reply was cool "Of course la. You always see me in the dark ma." Do you have dark eye rings and wonder why? Then try reading this siteWrongDiagnosis. It may not be accurate but it will help you in filling up your knowledge cap on health. Reading the Ayuverdic remedy for this is really something new for me. I would try asking Ayuverdic practitioners since I'm not sure what kind of sesame oil to drop into the eye! In 1971, at the age of 11, Li Cunxin was chosen to train as a ballet dancer at Madam Mao's Beijing Dance Academy. It was to change his life for ever. One of seven children growing up in a remote Chinese village, for the first time Li had enough food to eat. But the punishing training schedule made no sense to a young boy who had never seen a ballet. 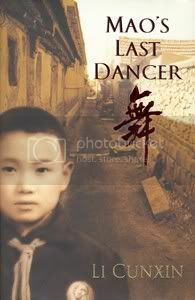 Mao's Last Dancer is his remarkable true story. It's pretty rare for me to review a book even though I really love it. For example, you don't see me reviewing my favourite author Lisa Jane Smith right?? But somehow this biography prompted me to write how wonderful this book is. The story begins with Li's childhood in his poverty commune in Qingdao, China. The poverty is vividly described from lifestyle to the diet. He and his family ate dried yam and occassionally corn bread as daily staple until Chinese New Year. The hard life he has to go through really makes me wonder what would I be thinking about life if I were in his shoes. I would surely be thinking that life is not even worth living ... why live a life where you are living to survive or barely surviving? The period of his student life in Madame Mao was tough and rigid. An insightful of the communist education. What really moves me is the author's dedication in overcoming obstacles in becoming the best dancer so he could make the country and family proud. The burden on his shoulder is beyond his description and yet it became his drive to succeed in dancing to be one of the world best. I'm not sure if I would read this book again for the third time [hopefully, I won't cry again] but I might watch the movie ... soon to be released. To all: This book is Highly Recommended to add into your library.